Being only my second ever Ballet and following on the foot steps of the enchanting and very emotional Manon, Swan Lake had an awful lot to live up too. That’s an odd thing to say about a world famous Ballet. During my last ballet encounter I found myself falling head over heels in love with the ballet. With its ability to command such emotions through expertly choreographed dance, and an orchestra that could have you holding your breath with the drama of the score. Love at first sight is tricky kind of love, will it live up to its expectations the second time around. Would I still feel so enchanted by the beauty the ballet? 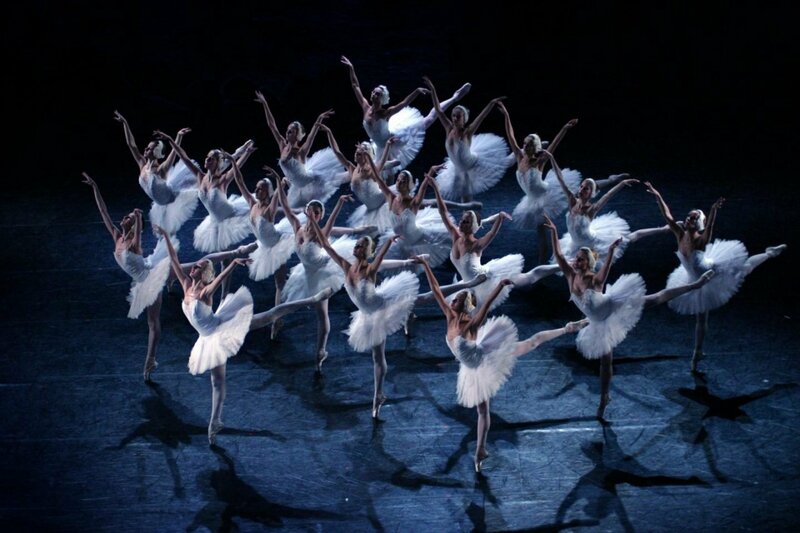 The Moscow City Ballets presentation of Swan Lake was spellbinding and the perfect Ballet to confirm that indeed Ballet is an art I aim to enjoy at every possible opportunity. And that it is never to later to discover love for a new art. Swan Lake starts out at Prince Siegfried’s 21st birthday (Daniil Orlov) where he is told that coming of age is a serious affair and he must find a wife. A Ball has been arranged for the very next evening and there, where a group of beautiful and carefully selected young ladies are invited as prospective fiancées, he must choose a bride. Siegfried has no desire to marry, wanting to maintain his youth and freedom. His good friend Benno (Dzmitry Lazovik) in his endeavour to cheer him up points to a flock of wild swans in flight and suggests a hunting expedition. During the hunt Siegfried is drawn to a captivating white swan who transforms into the most beautiful young woman. She is Odette, Queen of the Swans (Liliya Orekhova). The evil sorcerer Von Rothbart (Talgat Kozhabaev) had put her under a spell, where by day she and her friends must remain swans, but between midnight and dawn they return to their human form. The spell dictates that only the pure love of a young man can remove the curse. Captivated by her beauty Siegfried instantly falls in love with Odette and feels confident his love will destroy the spell. However dawn arrives and Odette must return to the lake and return to her swan form. The lovers bid farewell with the hope that the spell with be broken. However Rothbart plots to make the Prince break his vow. As soon as the Orchestra started to play Swan Lake had drawn me in. The enchanting score that was first penned by Tchaikovsky in 1871 and the Ballet first performed in 1877 draws you in to a world of breathtaking music telling the tale of heartbreak and despair, yet is portrayed in the most beautiful way. It’s mind-blowing to think audiences were enjoying this very same ballet 142 years ago. That the beauty of the music and dance has stood the test of time, to allow us to be enchanted by the very same score all these years later. The choreography and timing was perfect, when you are faced with in excess of 20 swans in costumes that are every little ballet loving girls dreams, and quite frankly some adults too! It’s apparent there is not an inch of room for error. Yet every step and graceful hand movement was perfectly delivered in a way that had you holding your breath in disbelief. Swan Lake is the epitome of grace, elegance and perfection that’s draws you in and has you feeling as if you are the only person in the audience. The music has a mesmerising calming effect on your soul, which enables you to forget everything in the world apart from what is going on right there on that stage. I honestly never believed anything had the ability to demand my concentration to such a level. And I left the theatre despite the sad overtone of the story feeling calm and uplifted having experienced such beauty on every level. The Moscow City Ballet is touring throughout January click here for the dates and if you are lucky enough to catch it, prepare to be utterly captivated. Disclaimer, I was gifted the tickets for Swan Lake for review purposes, however all opinions are my own and I had no idea the profound effect this truly stunning work of art would have on me.